Filming in the Cook Islands, we see what makes the perfect island wedding. We’ve also asked local wedding professionals to share their tips for brides planning a destination wedding. 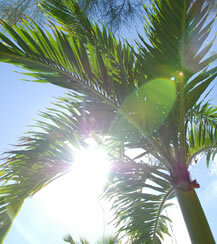 The best time of year for a wedding in Rarotonga is between May and November; these are the ‘Winter’ months. The moderate temperatures (20-30°C), and lower humidity, make conditions more comfortable, especially if you’re not used to a tropical climate . Even if you have your heart set on an outdoor ceremony, always have a ‘Plan-B’, such as marquee or alternate indoor venue. Flights tend to be cheaper when you book early: six-months or more in advance; or when travel dates fall outside of the New Zealand school holidays. Also check the Cook Islands events calendar for cultural and sporting events for you and your guests to enjoy (2015 is the 50th Anniversary of Self-Governance, so there are a host of extra events on offer this year). You can hold your ceremony any day of the week, although a surcharge may apply for weddings on a Sunday or Public holiday. Monday: As the start of the working week, things move fairly slowly in the islands. Restaurants are likely to be restocking for the week ahead. Tuesday-Thursday: These days are great options for a wedding, leaving Friday and Saturday free to enjoy local attractions. Friday: This is the big night on the island. If you plan a Friday wedding you can continue the party after your reception, at one of the nightclubs in town (Avarua). Bars and clubs are open into the small hours of the morning. Saturday: The Saturday morning Punanga Nui markets are great for local crafts, souvenirs and produce. This is something that you'll miss if you’re having your hair and make-up done. Clubs and bars close at midnight on Saturday. Sunday: A day of rest in the islands. Local custom is to attended church or catch up with family. A surcharge may apply for weddings on a Sunday. Keep in mind that there is a legal requirement to be in the Cook Islands three working days prior to your wedding date. Island nights Cook Islands dancing and drumming troupes perform at resorts and venues around the island most nights of the week and are a great activity to share with guests. See the local daily paper for venues and times. The most popular times for a wedding are when it’s cooler, either at sunrise (approx. 6:30am) or in the late afternoon (after 4pm). The light near sunset is fantastic for photography and videography (5-6:30pm). Check Rarotonga sunrise and sunset times. Sunlight hours are approx. 6:30am-6:30pm (give or take an hour). There is no ‘daylight savings’ in the Cook Islands. The sun rises, and sets fairly quickly; twilight is short compared to New Zealand. If you’re planning a beach wedding it pays to check the predicted tides (high tide = less beach). The secret to planning a perfect island wedding. Resort, wedding planner or DIY? Popular times for a ceremony are either at sunrise, or in the late afternoon. Beat the heat. Remember that it gets hot under the sun. Consider choosing a lighter fabric; an off-the-shoulder gown style; or fewer layers than for a New Zealand gown. For the men, avoid heavy fabrics, dark colours, and three-piece suits. Formal (long) shorts are great for outdoor beach venues. Concealing ‘glow’. Dress your wedding party in a colour and fabric that won’t show perspiration. Stylish shade. A beach wedding is the perfect opportunity for sun-smart fashion accessories: parasols for the girls, and stylish hats for the guys. Footwear you can wear: Consider bringing two types of bridal footwear. A heel for your ceremony (perhaps with a heel stopper); and a simple wedge or toe-thong for the beach photoshoot and added comfort for your reception and first dance. Fantastic flowers: In addition to creating a spectacular bouquet, a fresh-cut island flower makes a great hair accessory. Place your flower so it can be seen during your ceremony: on the side that will be facing your guests and photographer when you turn to exchange vows. Guys look great with a tropical buttonhole or simple white flower neck garland (ei). 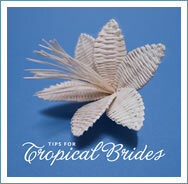 Seasonal flowers: Tropical flowers are seasonal, so check availability with your wedding coordinator. A toe-thong is more practical than a heel for a beach photoshoot. Keep cosmetics cool: The last thing you want on the morning of your big day is to find that the perfect shade of nail-polish or lipstick has been affected by the heat or humidity. Check your make-up care guidelines for storage instructions, or buy make-up that has been designed for humid conditions. Nail polish - less is more: It takes longer for nail polish to set, so use fewer coats (a maximum of two is recommended). Also allow for more drying-time between applications. Frizz be gone. Humidity can cause abnormal frizz or unwanted curls, so be sure to pack some frizz-prevention products. Opt for a casual ’do: Hairstyles that use a lot of hairspray can come unstuck in humid conditions. Opt for a loose/casual up-do and accentuate it with a fresh local flowers to match your bouquet. Go pro: If you have plans for a more structured hairstyle, or have a make-up look in mind, book a local hair and makeup artist. They are used to tropical conditions and have the knowledge and products to keep you looking stunning – all day long. Sooth bites and scratches: Weleda Combudoron Gel is a herbal product that is great for reducing swelling and itchiness if you get a sandfly, mosquito bite or coral scratch while exploring the island. Bring sun block - and apply it: For the days leading-up to your wedding, take special care to apply sunscreen to your face, arms, neck, and upper back. When travelling around the island choose a top that is similar in cut to your gown to avoid tan-lines in photos. Looking after the guys: Outdoor activities such as fishing and golf can leave the men a little red-in the-face, or feeling the effects of the heat. Suggest a hat, sunscreen, seeking shade in the middle of the day, and drinking plenty of water. (Also try to avoid sunglass tan-lines). P(hamper) yourself: Arrange a breakfast or lunch hamper to enjoy while getting ready. Outdoor-proof: Before putting on your dress, apply sunscreen to exposed areas: such as your shoulders and the tops of your feet. If you’re planning an off-location photoshoot, take some bug spray with you. Switch off air-conditioning: Turn off air conditioning to your room half-an-hour before your ceremony. This will give you time to adjust to the (outdoor) heat and humidity, and make final adjustments to your gown and make-up. Trust the professionals: Delegate tasks, and be reassured that the wedding professionals on the island bring a great deal of experience to making yours, a day to remember. An up-do is cooler and will look great for the entire day. Remind the guys to cover-up while they’re exploring the island. Get them to the ‘church’ on time: In Rarotonga, the round-the-island bus service circles the island twice per hour (one bus travels clockwise, the other anti-clockwise). Figuring-out when-to-catch-which-bus will leave most guests scratching their heads; arriving too early or too late; or simply stranded. Consider chartering a bus or two from Raro Tours to collect your guests from their accommodation, and to drop them home at the end of the day. Pick a great MC: Have someone on hand at your ceremony venue who will make your guests feel welcome, let them know the plan for the ceremony, make introductions and guide them to their seats in case the groom is busy with his last-minute preparations. Bonus tip: Friends with family Cocotots hire out buggies, car seats and toys here in Rarotonga. So your guests can use their luggage allowance for the essentials – things like chocolate and coffee! Protect your guests from the elements. Family-friendly? Ensure your reception venue caters for all ages in your wedding party. Hire childcare so that your guests can relax. Personalise your refreshments: Create personalised bride and groom cocktails for your guests. Reception on a budget: A classy cocktail-style bar with canapés is a cost-effective reception option. Day activities: Activities are a great way to enjoy your Pacific-escape with your family and friends, and Rarotonga provides many options including mountain safaris, lagoon cruises, visits to a cultural centre, or exploring the beaches around the island. Honeymoon escapes: From Rarotonga it’s just a short flight onto to the island of Aitutaki or Atiu. Also check with your travel agent for multi-island travel packages . Three-day waiting period: You need to apply for your marriage licence at least three working days before the ceremony, not including the day of application. In special circumstances, this waiting period may be waived if you complete a written application and pay a $45 waiver fee. Documentation: You will need your passports, birth certificates (or certified copies). If you’ve been married before you'll need, a copy of divorce papers or the death certificate of your spouse. All documents must be in English or be supplied with English translation. Payment: Marriage License $50, Marriage Certificate $15, Apostille Certificate/Seal (if applicable) $20. An Apostille Certificate authenticates a document for use in another country. An Apostille Certificate is not required for New Zealand or Australian couples. Most resorts in Rarotonga offer wedding packages, and often require that you and your guests book a certain number of nights accommodation. Wedding venues (outside of the resorts) may provide a coordinator who will arrange decorations and catering. There are also a growing number of independent wedding planners who offer personalised service and access to exclusive (private) venues. If you’re self-planning, a popular choice is to make a research trip prior to your wedding, to visit potential ceremony and reception venues and meet with suppliers. For services such as marquee hire, a hair stylist or gourmet foods, the Cook Islands Yellow Pages is a good place to start. Add your tips and feedback to our Facebook page. 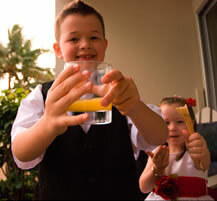 Hire childcare for the reception so that your guests can relax. Add some tropical punch to your wedding with Island Booth! Unlimited prints, fruit-flavoured backdrops, island style props. Instant fun! 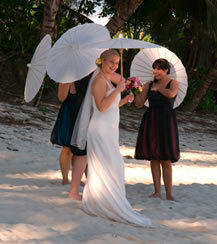 Links to Rarotonga wedding professionals including wedding planners, photographers, and hair-and-makeup artists. Meitaki (thank-you) to the following wedding professionals for sharing their tips: Atiu Villas, The Edgewater Resort & Spa, Muri Beachcomber, Nior Photography, Pacific Bride, Palm Grove, Sea Change Villas, Tiare Films, Wedded Bliss Rarotonga, The Wedding Guys, Wedding Planner Rarotonga. Photography credit: Tiporo Photography, Rarotonga, Aitutaki, Cook Islands. 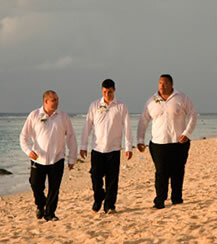 Search terms: Planning a wedding in Rarotonga, Planning a wedding in the Cook Islands, Planning an island wedding, Rarotonga wedding ideas, Rarotonga wedding packages, hair and makeup in Rarotonga, venues for Cook Islands wedding, Rarotonga wedding guide, getting married in Rarotonga, wedding reception Rarotonga, best time to get married in Rarotonga, Rarotonga wedding legal requirements . Published by Tiare Films, 14 Dec 2010. Updated 29 Jan 2015. Our island-themed photo booth is great entertainment for your hen’s party, reception or after-party. Book at islandbooth.com. Watch our Rarotonga wedding film highlights.